We may have last seen Korra a month ago, but three years have passed for our Avatar and her friends. The trailer for the final season shows us how much the world has changed in those three years—and teases the return of a favorite Avatar: The Last Airbender character. There's so much to talk about in this trailer: Korra's recovery and new look! 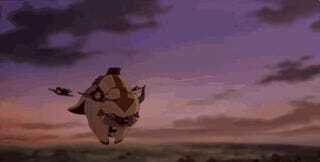 Airbender wingsuits! More mech suits! Turmoil in the Earth Nation! (Things don't seem hunky dory following the murder of the Earth Queen.) And of course, we've got to talk about the character who is named in the final seconds of the trailer. Yes! Toph! The Legend of Korra returns to Nick.com in just one week. Get ready.